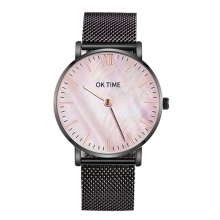 This simple, luxury, and fashion design wrist watch will go great with any outfit and any occasion. It enables you to easily spice up a normal outfit and add style to your life. Scratch-resistant crystal glass surface and sturdy stainless steel clasp. Solid with high durability, for a long service life. Easy and comfortable to wear, convenient to put on or take off. Minimalist design will make you feel more relaxed and elegant. Suitable for business meeting, parties, shopping and daily life. Perfect gift for mom, girlfriend, wife and female friend, etc. 1. Due to the difference between different display screens, the pictures may not reflect the actual color of the item. 2. Please allow slight deviation due to manual measurement.